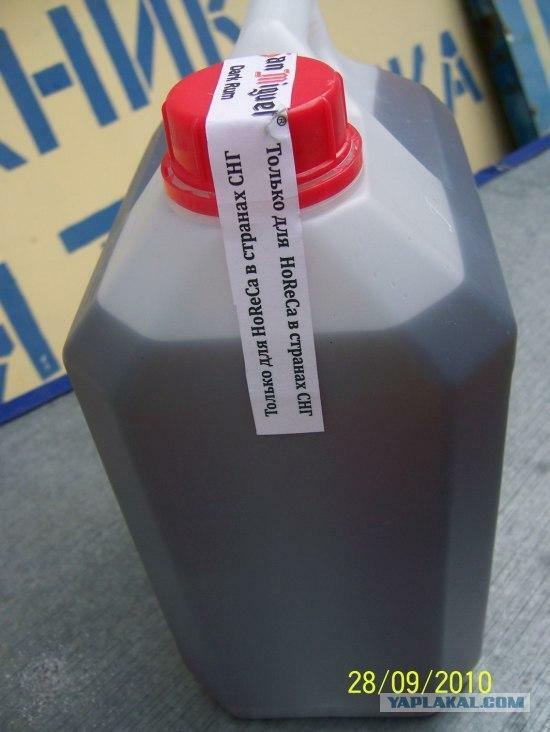 Did you know that in Russia you can buy rum even in a plastic jerrycan? Looks kind of like motor oil in that bottle! Something like that, anyway. Guys, where in Moscow I can buy it?? When you buy it will you buy some extra cans and drop it off at Islamic Republic of Iran embassy? I will pick it up during my next visit. You can buy wine in boxes. What’s the issue? 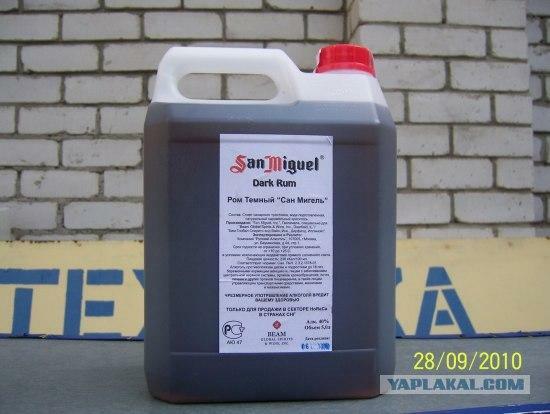 I guess that stuff must be produced by the Filipino San Miguel. The Spanish beer was originally brewed under licence from the Filipino company which is why they have the same logo. It’s one of the largest companies in The Philippines and, among many other products, does produce rum. Doesn’t look very attractive in this cannister… More like some chemical. You can clean your toilet with it after you drink it. Is good as “ron ponche”…yum! Only 40% of alcohol ? Here in French Guyana, our rhum has 50% to 55% alcohol. At about 5e per liter its quite inexpensive. The Soyouz technicians of the rocket base must be delight ! 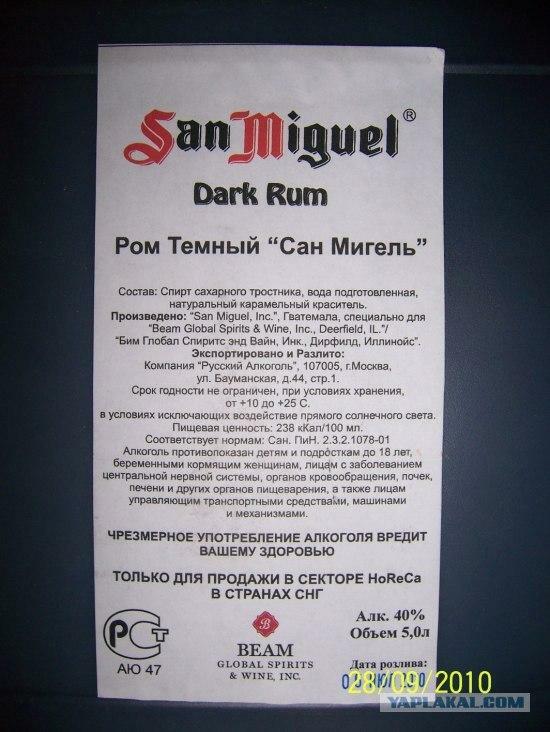 When I was in Nicaragua in 1988, during the US’s dirty war against the Nicaraguan people, you could only buy 1 bottle of Nicaraguan rum at a time, that is, you could buy all the rum you wanted, but could only buy 1 bottle. This was because of a glass shortage, So you either had to bring your own containers, or get the rum put in a plastic bag. On one shopping trip down the mountain, where our brigade was, to the city of Matagualpa, I was sent with several 20l containers! it’s for retail dealers only. I know it’s considered unhealthy to use plastic containers for alcoholic drinks, especially this kind of cheap plastic. Alcohol gradually dissolves some plastic chemicals which finally end to your stomach. But I guess “this is Russia”, nobody cares about such “minor” issues. Structure: spirit from a sugar cane, cleared water, natural dye. Fake drink for original Kirov. And Russia doesn’t have a drinking problem. They drink, they get drunk, what’s the problem? Hi regards from Guatemala, that is a nice rum, maybe later i could send you some more pics about this rum. I’m from Guatemala and I have never heard or seen that brand, the most famous and high quality is Ron Zacapa Centenario which have won the Best Rum of the World prize but that was 2 or 3 years ago and it comes in bottle and it’s expensive. 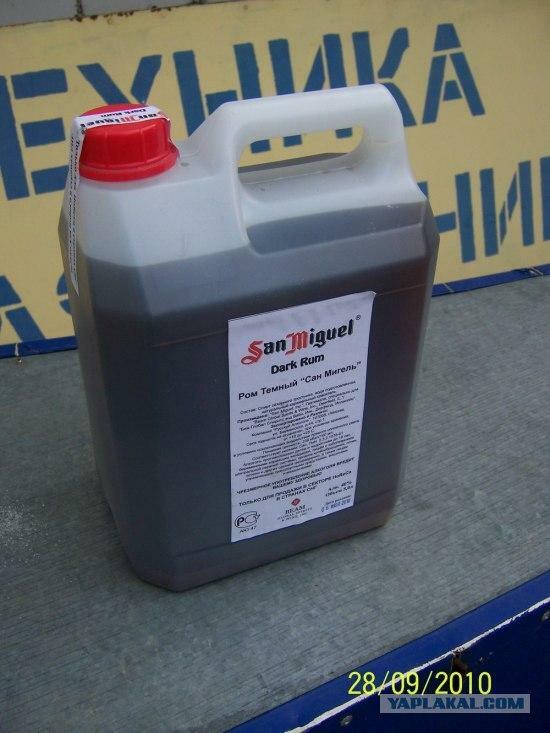 See the plastic container obviously it’s fake -By the way San Miguel sounds a little generic or common to be a good brand-. But i think there is a chance for them to be toxic.